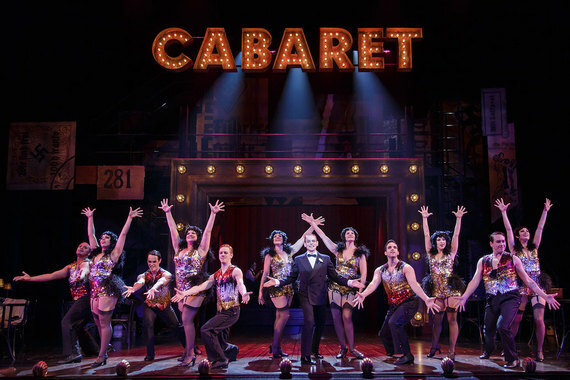 Village Theatre's production of the classic musical Cabaret keeps audiences engaged with dynamic singing, dancing and acting throughout the show. This is not an easy task when one considers the historic timeframe of the show - the end of a gala era as the Nazis came into power in Germany. Then, there's all the issue of anti-Semitism, which is addressed quite pointedly with the number If You Could See Her in which the Emcee serenades and dances with his "partner" - an actress dressed in a gorilla suit and wedding dress. This performance of Cabaret is, however, far from as dire as the stage appears prior to the show starting. In the beginning, the Kit Kat Klub is shown as it would be after the Nazis took over, but it magically transforms into the glittery, extravagant setting where almost anything is available and possible when the Emcee enters and begins introducing "the beautiful girls and boys." The other principle player who can't be missed is Billie Wildrick as Sally Bowles. Wildrick dances and sings with a vibrancy that leaves the songs stuck in your head days later. And these two key cast members are brilliantly supported by the other actors, the highly innovative staging and a "house band" that becomes a character in and of itself as it rolls out to center stage on a moving platform from time to time. All of this makes Village Theatre's performance of Cabaret a show that should not be missed. It's well worth a drive from Seattle to Issaquah (or next month to Everett).